All it took was a simple dish of garlic fried in hot anchovy oil, added to Tagliatelle with the contents of the jar of anchovies in chili oil, served with a green salad. 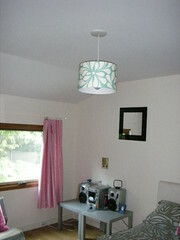 A really easy supper and Steven was more than happy to put up the Mibo pendant light in Verity's room. And he didn't even mention the cost!